The North Carolina End of Course (EOC) or End of Grade (EOG) results have been reported. The media has done it’s best to ignore that the scoring system was changed from last year to this year, making comparison of the scores impossible. Remember, the scores for the first year under Common Core were at horrifying 37.3% drop state-wide. Factor in the hot mess that Read To Achieve is becoming and one can see why they wanted to pad the scoring system. Lindalyn Kakadelis of John Locke Foundation has dug into the scores and cobbled together a comparison as best as can be done, given the way the scoring was changed. Kakadelis looks at the overall 3rd through 8th grade reading and math scores. The changes in achievement levels went from a scale of four to a scale of five this year. Even with the change, the scores in reading and math only improved .8%. Hooray for high reaching Common Core? However, here is an explanation I think most can understand. The old level 1, which is considered not at grade level, stayed the same regarding cut scores. So there was no change at this level. The current levels 4 & 5, are the previous levels 3 & 4, which are considered at and above grade level. The change basically occurred only at level 2, which has never been considered at grade level. The 2013-14 new level 3 students were students previously performing at level 2, but scored within “one standard error of measure.” One of the reasons the State Board added this level was due to the high stake consequences third grade students faced with “Read to Achieve.” Using the “new” level of “proficiency,” there are 12.6% more third graders “proficient” this year. Simply using 5 levels instead of the 4 levels increased the level “proficient” in every grade in every subject, which in of itself is another discussion. Does this lower the bar, or does it help students who possibly could pass the test with one more try? Comparing levels 3 & 4 in 2013 with levels 4 & 5 in 2014, gives a more accurate view of any gains made over the past two years. Currently third through eight graders, 55.3% in reading, and 56.9% in math are NOT considered to be college and career ready. The overall third through eighth grade reading and math scores increased 0.8% from 2012-13 to 2013-14. At this rate, it could take us 30 years to reach 70% of our students being at the college & career level. Boy, that is comforting! Looking at the results you need to keep a few facts in mind. 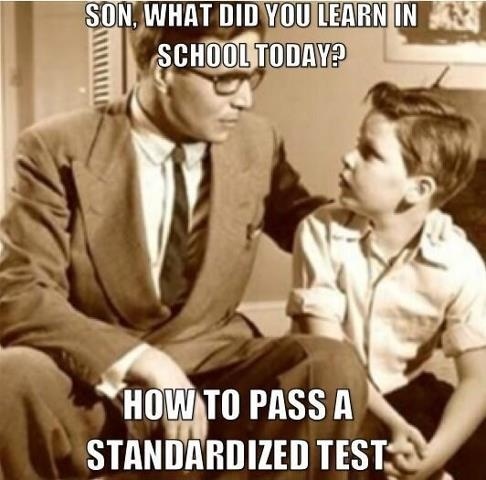 First, do not forget the Common Core Standards and new tests developed by DPI have been in place since 2012. Professional Development began the summer of 2011 for these changes. In fact, over $66 million has been spent on professional development. IS this what you call a “return on investment?” Are our students and teachers inept, or could there be something wrong elsewhere? DPI lauds the highest ever graduation rate of 83.8%. However, we only have 47.8% of our high school students performing at “college and career” ready level. Can someone explain THAT to me? Yes, I’d like someone to explain that too. I’m still waiting for a detailed explanation of this ‘professional development’ that was done to the tune of $66 million dollars out of the Race To The Top grant. Remember, Dr. Atkinson changed that number from $58 million to $66 million during the Common Core Legislative Research Committee hearings. Dr. Atkinson offered no detail about what the training entailed, who conducted it or who participated in it. In fact, she just simply said she took the word of the various districts that some kind of training was held. This entry was posted in Common Core, June Atkinson, LL1885, NC DPI, The Articles and tagged EOC, EOG, John Locke Foundation, Lindalyn Kakadelis. Bookmark the permalink. Thanks for sharing this. I’m passing this around facebook with friends and making sure people know why Common Core (whatever it’s called) is a BAD deal for everyone except those who are getting rich on it. Check out StopCommonCoreNC.org too. Lots of great articles and resources.